A little girl and her colossal friend teach a monster-size lesson about prejudging others in a charming new offering from Chris Van Dusen. Hattie McFadden is a born explorer. Every morning she grabs her life jacket and paddles out in her canoe to discover something new on the lake, singing a little song on her way. When her singing draws up from the depths a huge mysterious beast, everyone in town is terrified — except Hattie, who looks into the creature’s friendly, curious eyes and knows that this is no monster. 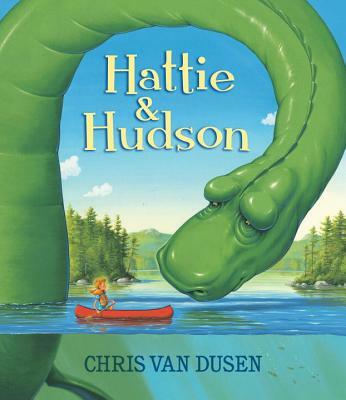 So Hattie sneaks out at night to see the giant — whom she names Hudson — and the two become friends. But how can she make the frightened, hostile townspeople see that Hudson isn’t scary or dangerous at all? Chris Van Dusen brings his colorful, perspective-bending artwork to this satisfying new story about acceptance, friendship, and sticking up for those who are different. Chris Van Dusen is the creator of many outstanding books for children, including The Circus Ship and Randy Riley’s Really Big Hit. He is also the illustrator of President Taft Is Stuck in the Bath by Mac Barnett and the best-selling Mercy Watson series by Kate DiCamillo. He lives in Maine. Van Dusen’s (‘The Circus Ship’) sleekly painted lake is a midsummer day’s dream: saturated greens, glimmering blue water and little red boats you’re dying to take for a spin. The gouache illustrations are filled with details that bring light and life to the pages, from each water droplet to every rolled-up sleeve. Hudson, although enormous, is drawn with expressive eyes and a lovely green hue that reflects the stars in the sky...Outdoor enthusiasts will celebrate this brave young heroine as she schools the town on acceptance. Van Dusen’s stunning illustrations offer unique perspectives, from an aerial view of Hattie first making eye contact with two glowing eyes beneath the silvery water to a vertical spread of Hudson triumphantly emerging in the sunlight with Hattie perched on his head...This eloquent, evocative book about compassion is perfect for sparking discussions on prejudice. A sensational choice for a seasonal storytime. The story’s message—don’t judge by appearances—is gently delivered in a tale just right for one- on-one sharing. Chris Van Dusen brings his colorful, perspective-bending artwork to this satisfying new story about acceptance, friendship, and sticking up for those who are different. The evocative illustrations, and timeless themes of acceptance, friendship and being an upstander will resonate with young readers, and provide a good jumping off point for conversations about courage and kindness. Told through Chris Van Dusen's signature lively illustrations, Hattie & Hudson is a delightful summer read full of wonder and heart. —Bill Grace, Buttonwood Books & Toys, Cohasset, Mass.